Ever since Magnus Carlsen’s shock withdrawal from the Candidates Matches it’s been suggested that Garry Kasparov was behind the decision. In a recent interview, however, Kasparov blew that theory out of the water and expressed his disapproval of his former student’s actions. Kasparov was interviewed by Stefan Löffler for the German Frankfurter Allgemeine newspaper. I came across the interview in Russian translation at Chess-News, which in turn took it from inosmi.ru, a site specialising in translating the best articles in the foreign media into Russian. Hopefully not too much has been lost in translation! On the 23rd of December it was officially declared that your former pupil, Magnus Carlsen, won’t take part in the World Chess Championship. It’s not good, it’s the wrong decision. At his age and given his development he should be fighting. At the chessboard. Do you understand his motives? He’s right when he criticises the system, calling it unfair. FIDE has organised the whole cycle chaotically. I also don’t like the fact that the matches are going to be run without a break between the quarterfinals, semifinals and final. Magnus would still be the favourite, though physical and psychological aspects would play a large role, and there’d also be a certain element of luck. I think his criticism of the format of the event is only a pretext. So what are Carlsen’s real motives? He doesn’t seem to be comfortable taking on such a serious challenge. Some observers think that you advised him to withdraw from the World Championship. I wouldn’t have approved. In any case our cooperation ended last spring. Do you regret that you spent a year coaching him? Not at all. Out training games, and joint analysis with such a talented player, all gave me enormous pleasure. He has the ability to correctly evaluate any position, which only Karpov could boast of before him. I helped Magnus in areas where he’s lacking: opening preparation, a more systematic approach to work and sharper play. 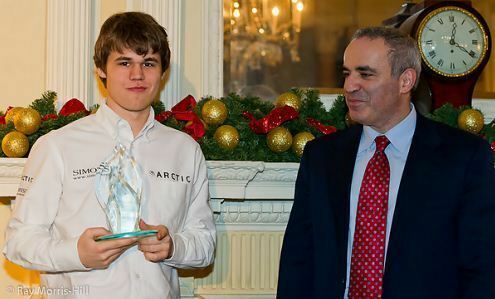 What did you think when you heard that Carlsen had refused to take part in the World Championship? I wasn’t surprised. Even during our training camp in Marrakech a year ago I spoke about his insufficient match experience, but he didn’t want to discuss it. He’s still never played a match as favourite. I advised him to hold a training match against a world class chess player who wasn’t among the candidates to become World Champion. When you topped the world chess rankings you would only lose about a game a year. In the last three months alone Carlsen has lost seven regular games. Why? Because he’s not doing the intensive work he needs to. For me, that’s the only explanation. Working means constantly being involved with chess and maintaining his sharpness. The way he lost to Anand in London was terrible. He should have lost to Kramnik as well. Nevertheless, he won the tournament, which shows that he can play better. At the board he’s phenomenal. If he also works intensively enough then he’ll dominate. Can you imagine a situation where you’ll start coaching Carlsen again? No. He’s in charge of his own affairs. He’s growing up just now. Does he need time to rebel? He needs time to think about his future. It seems as though everything comes easily to him, but his rivals aren’t sleeping. A year ago he was dominating chess, but he isn’t anymore. If he’d continued to work intensively then he could have beaten my record – a 2851 rating. The headlines would have been great, both for chess and for him personally. 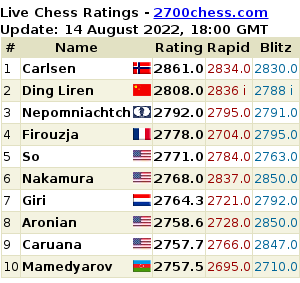 You once said that before Carlsen’s done he’ll have significantly changed the game. Do you no longer expect that from him? A player of his talent, with his media traction and the first Western chess player to be number one after Bobby Fischer – all of that would be extremely useful for chess. But for that he has to constantly prove his superiority. He’s not doing that anymore, and that’s not sufficient for his name to be mentioned in the headlines and to interest people who otherwise wouldn’t care about chess. Magnus is twenty now. At that age he needs to fight. He has tremendous talent, and to a certain degree he’s obliged to devote that talent to the chess world. When you were the age Carlsen is now, you won not only at the chessboard, but in the struggle for the World Championship you also came up against the resistance of the Soviet Chess Federation. How did that period of your life from 19 to 22 influence you? It’s visible even simply in the fact that I’m still here. Setbacks and serious challenges strengthen your character. If you avoid them then that won’t go unpunished. But is it fair to demand that a twenty-year-old sacrifices everything for chess? You could talk about sacrifices if he was only doing it for others. But it would also be enormously financially beneficial for him. To win you needed the votes of people who previously voted for Ilyumzhinov. He’s personally spent millions on chess. Perhaps you had to be more cunning and fight the officials standing behind him who’d filled their pockets, rather than mock Ilyumzhinov? But Ilyumzhinov is ridiculous. Only in November he declared he’d fly to New York and meet Mayor Bloomberg in order to buy “Ground Zero”. He’s capable of passing any lie detector test because he believes what he says. Ask him what colour the aliens were and he’ll tell you, on camera. This man has discredited chess, and now personally lacks the resources he used to have at his disposal. 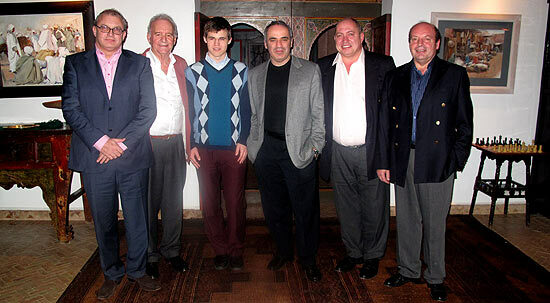 It seems that not all the players in the FIDE elections have reached a reconciliation. – On his coaching activities (5th question), “preparation before events” is actually “opening preparation” – no big surprise here … . Not surprised with Kasparov’s comment about Carlsen’s decision, and I think he’s right. I don’t like a lot of things about Kasparov, but his overall approach to work, struggle, fighting spirit in chess, I respect a lot. All that is a legacy of Botvinnik I suppose. Thanks for the great interview! Kasparov is spot on here. Carlsen has a luxury issue – life is too easy, he hasn’t suffered yet, he’s Norwegian so a citizen of one of the richest countries in the world…and he’s probably close to being financially independent. I would not be surprised if he leaves professional chess within the next 3 till 5 years. Excellent article, thanks as always for the translation! Sounds like Kasparov has firmly pegged Carlsen. A pity, but then players willing to work as hard as Kasparov and Fischer are quite rare. Even immense talents like Karpov, Capablanca, Tal, etc. weren’t willing to put in the time that Kasparov and Fischer did. Maybe Alekhine and Botvinnik (at times)? And I’d still bet that Kasparov could dominate again, with a year or two to get his playing form back into shape! Interesting for a couple of reasons. First, during the Karpov campaign, Garry sharply criticized the situation where the world elite are expected to kowtow to FIDE’s whims in situations like this current “cycle,” which Garry acknowledges is “unfair” and has been characterized all along by a particularly acute form of the organization’s typical mismanagement. Similarly, the two Ks specifically decried the fact that the current FIDE leadership is purposefully and progressively degrading the championship with the goal of precluding the emergence of an influential champion who might impinge on the FIDE leadership’s fiat. Second, I believe that Kasparov, when he was world number one in rating, at least twice refused to participate in FIDE ad hoc “championship” “cycles.” (This doesn’t count the time when he purposefully was abiding by the PCA/FIDE schism.) Perhaps the distinction is that putting up with crap early in your career — as Garry certainly had to, courtesy of both FIDE and the Soviet federation — is more necessary than doing so later in one’s career, when, based on his own example, one would assume that Garry would advocate that top players not tolerate any FIDE BS whatsoever. In short, it was no accident that there was widespread speculation that “Kasparov was behind the decision” by Magnus not participate. After all, that decision seems broadly consistent with Garry’s words and actions, recently and during the course of his career. I do not understand Calvin Amari’s post, guess it has to be interpreted given his track record as a Carlsen fan. It is easy, fashionable and often legitimate to criticize FIDE … . Yes, the current cycle was poorly organized, notably with regard to changes of venues – but the latest change, moving the candidates event from Baku to Kazan, merely corrects an earlier mistake, better late than never. But in what respect is the cycle unfair, unfair to whom? Is it unfair to Carlsen that he still had to prove himself in matches against others? Either he is as dominant as his fans claim, then it’s a mere formality. Or he isn’t as dominant, then it makes perfect sense that others (e.g. Kramnik and Aronian) get their chances. An ad hoc “cycle” would be, as some people suggested, to directly proceed with an Anand-Carlsen WCh match. This would be unfair to others, maybe even unfair to Carlsen himself: lingering questions would remain even after winning such a match!? It can be argued that Kramnik and Topalov had such privileges in the past, but this doesn’t justify current/future privileges for Carlsen … . In short, the portions of my post that Thomas takes crooked aim at come directly from the present Kasparov interview. As far as the real point of my original post, that, notwithstanding the present interview, Carlsen’s decision is to a considerable degree consistent with Kasparov’s past words and actions, I see no disagreement. Slightly sidestepping the heated argument… the one reason it was, in my opinion, inconceivable that Kasparov was behind the decision was that Carlsen went on to criticise the reigning World Champion having privileges and suggested that e.g. they could simply hold a tournament with no privileges for the Champion (except being seeded into the tournament). That would, I assume, be absolutely anathema to Kasparov, and his whole idea of chess. Another point, which I made elsewhere, is that it’s slightly ironic for Kasparov to say what he has now, as it would also fit perfectly as criticism of his own refusal to play in the Dortmund Candidates Tournament – another less-than-perfect event where Kasparov would still have been favourite (as he says Carlsen would have been this time round). “The morning of 4 December, the day of the sixth game, began for Kasparov with an unexpected telephone call. On the line was Moscow – Mikhail Botvinnik. He really flabbergasted his pupil with the question: “Do you remember what event took place 50 years ago?” It was hard to work out, but Gary still found the answer: “In 1933 you played a match against Flohr”. “And how did that encounter go?”, followed the question. “It seems you lost the first and sixth games, and then got your revenge in the ninth and tenth games”, Kasparov replied. “Well, so look at what an advantageous position you’re in now. You still haven’t lost the sixth game!” concluded Botvinnik, adding, “And in general everything’s fine. You just need to keep things together and you should win the match”. Korchnoi lost the sixth game and eventually Kasparov won easily. Another thing to mention there, perhaps, is that the journalist talks about Kasparov saying in an interview from that time how proud he was to have become a Communist Party member. Kasparov’s comments about fighting the establishment and all those who were against him always need to be taken with a huge pinch of salt. I quite agree, mishanp. I didn’t believe that Kasparov was behind the decision for a number of reasons. I did, however, appreciate why it was that many did assume that Garry was behind the decision. As noted, the widespread view simply was testament to the fact that Magnus’s decision was consistent with what many expected Garry’s opinion to be, based on his words and actions. Your observation about the irony at play here is well taken. Incidentally, while the circumstances were somewhat unique, there were certainly times when even Garry would not accept the concept of FIDE champion privileges. Part of the problem in discussing the championship in the era of FIDE’s current leadership is that one is prone to conflate our historical associations of the candidate cycle with a very different reality of today. In an era where FIDE mints as many world champions in one six-year period as there were in the first 60 years of the title, it is necessary to change our perspective. Finally, I should note that, every time I see anything from Garry criticizing Magnus, I still get the sense that he very much cares about Magnus doing well. The fact that Garry wants the current world number one to work and fight more hardly suggests hostility, nor does Garry’s expressed view that he would be disappointed if Magnus does not reach his full potential and surpass some of what Garry achieved. This attitude is a credit to our greatest world champion. @Calvin: I don’t understand your aggressive tone, does it offend you to be considered a Carlsen fan? To me it doesn’t matter that the remarks about the cycle being unfair were Kasparov’s (you obviously agree with Garry), my question stands: what exactly was or is unfair about this cycle? If it refers to privileges for the defending champion, it isn’t unique to the current cycle – one could rather call it “tradition”, and mishanp is certainly right that Kasparov wouldn’t have abandoned champion’s privileges as long as he was champion himself. This was Arne Moll on Chessvibes – I respect and like him as a chess journalist but disagree with him in the given case. Maybe he genuinely does, my impression is that Kasparov cares about himself – I interpret his remarks as: I take partial credit for Carlsen’s successes, but his less impressive results (Olympiad, Bilbao, also – see the above interview – his shaky play in London) are his own fault. So, even though he won’t coach Carlsen again, he might comment on his future successes: “Magnus finally grew up and listens to my parental advice …”. Kasparov had 1.5-2.5 against Korchnoi after four games, and Fischer-Petrosian was 2-2. I’ve never heard a single Carlsen fan claim that he’s so dominant that winning four game matches against top opposition would be a mere formality. The minimatch system is very unpredictable, as shown by players like Kasimdzhanov and Khalifman winning the FIDE title ahead of much stronger players, and by the score in Kasparov-Korchnoi after four games. It does not offend me to be considered a Carlsen fan. I am, just as I am a fan of Anand, Kasparov, Kramnik, Karpov, Aronian, Kamsky, Shirov, and literally scores of others including a some who are nearly 300 rating points below Magnus. Heaven knows what conclusions you will draw from this. I for one can’t pretend to follow most of your argumention. the problem is that you assume that it is argumentation as opposed to senseless blather.